Here at Fresh Tilled Soil, experience maps are a crucial part of the strategy and design process. It’s a foolproof way to illustrate all the different touchpoints that a user interacts with in any given experience. Recently, I worked together with my colleague Jenna to create a template to streamline the process for our team in the future. My goal is to share a comprehensive list of the dimensions required to create an experience map more efficiently. Starting from scratch with no particular project in mind allowed me to strip down the template, becoming flexible enough to support the variety of layers that an experience map may need (depending on the project). 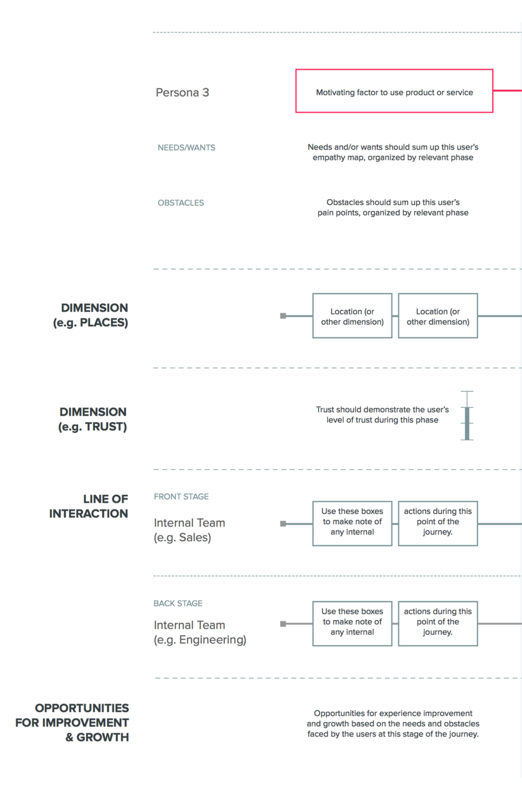 One can have several different dimensions on one timeline—the most vital of those being the user journey and opportunities for improvement, with room in between for anything else that is important to the experience. An important thing to note is that no experience map is complete without demonstrating user motivation. When illustrating the phases, remember that the pre-experience is just as important as the post-experience (in fact, it’s all part of the WHOLE experience). Timing: All experience maps run on a timeline, whether that is over one hour or an entire year. Break up the timing into sub phases of the experience to frame the user journey. Personas: Always tell the story through the lens of your most important users. The experience mapping phase is most useful after you’ve already done some user interviews and consolidated that information into personas. Empathy data: In order to gain insights from your experience map, you should try to include data on each persona’s thoughts, feelings, words, and actions. Depending on your project, you could use direct quotes, or you could filter it all into summaries for each phase. Obstacles: Don’t forget to create a special section for obstacles (pain points) that are impeding or frustrating the user. These are normally concluded from the empathy data and will help to inform opportunities for improvement later on. Channel: Depending on the project, it may be important to make note of what channels the user is interacting with at each step of the experience. These could include things like desktop computer, word of mouth, or talking on the phone. Detailed dimensions: In many experience maps, you will often feel the need to go into further detail on another aspect of the experience if it’s a large part of the story. This could be anything from location to trust level to line of interaction. 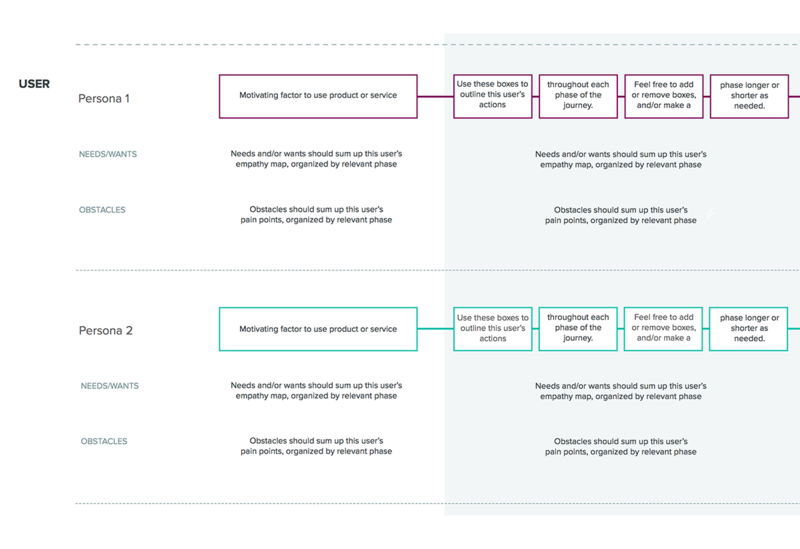 Many of our maps at FTS include a line of interaction based off of the service mapping model, to demonstrate both front-stage (customer-facing) and back-stage (behind-the-scenes) employee actions and how they relate to the customer experience. Opportunities for improvement: This is by far the most important part of the experience map—without it, the project cannot move forward. These opportunities are insights informed by each persona’s empathy data and obstacles throughout each phase. Experience mapping may lead to a new or improved product, or it may lead your team to focus on a different problem uncovered through the process. You can even create more detailed experience maps highlighting one piece of a larger experience. Whatever the result is, it will undoubtedly clear the path for insightful solutions. Kat truly shines in design work that is heavy on research and collaboration. She enjoys diving in, getting her hands dirty, and researching every detail to create the most relevant and impactful design solution possible.